On an uncharacteristically warm though still January-grey day, Mike & I decided to get crackin' on our newly formed Cleveland Bucket List. 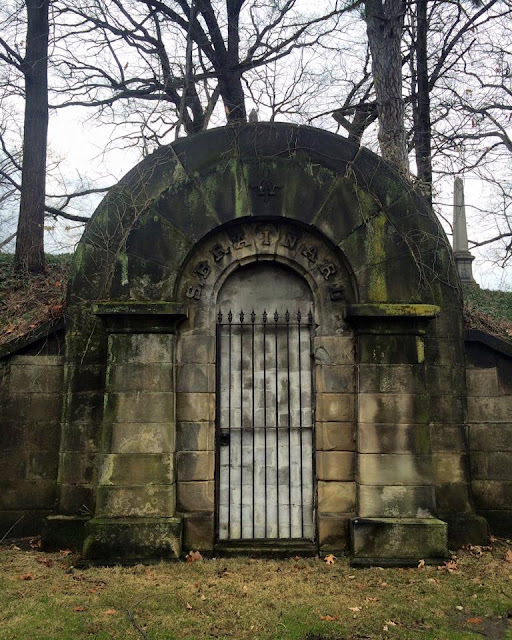 This Saturday, we explored Lake View Cemetery, a 285-acre space in East Cleveland where more than 104,000 people are buried. Among them are President James A. Garfield, philanthropist John D. Rockefeller, comic book writer Harvey Pekar, detective Eliot Ness, the guys who founded Western Union & Sherwin-Williams, & the inventors of both the gas mask & the Salisbury steak. In other words, it's a pretty interesting - & beautiful - place to visit. I struggled a bit with with whether or not it was weird/creepy to take photos - especially selfies! 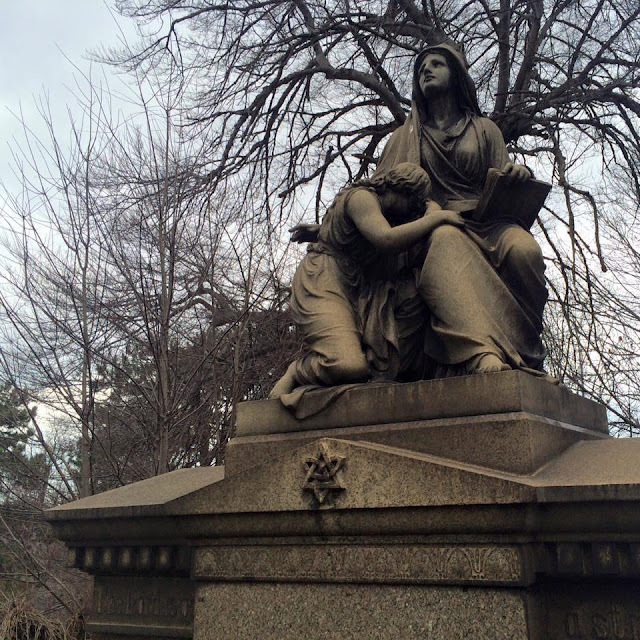 - in a cemetery, but the cemetery is also host yoga classes & weddings, so... I think it's fine. One of my high school friends even had her engagement photos taken there! The cemetery was bustling when we visited, full of runners & tourists & employees who looked relieved to be doing maintenance work without having to bundle out. 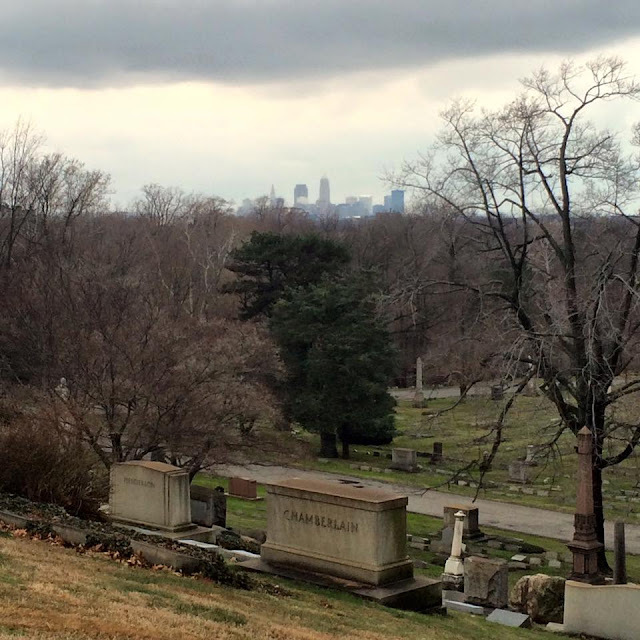 The views from certain points in the cemetery are incredible, not even close to properly captured by my iPhone (especially on such a grey day). Not bad views for the afterlife, eh? I can't wait to go back on a sunny summer day when everything is in bloom. 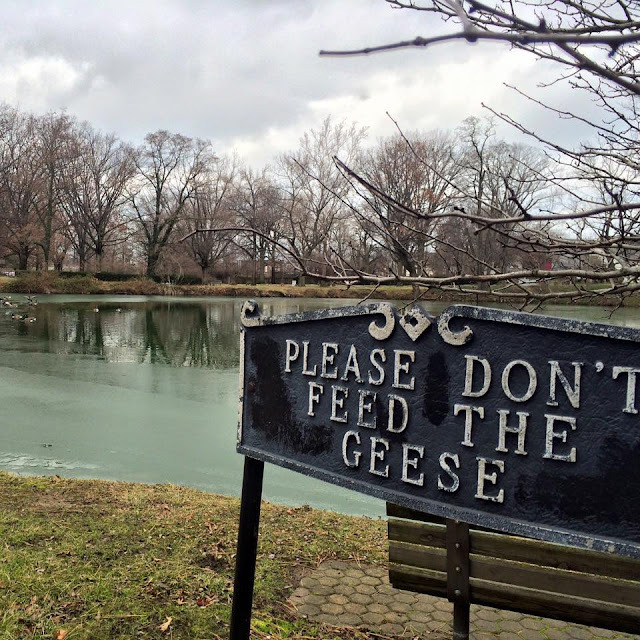 Even in winter, you can see how beautiful this place must be when it's boasting Ohio's greenery. 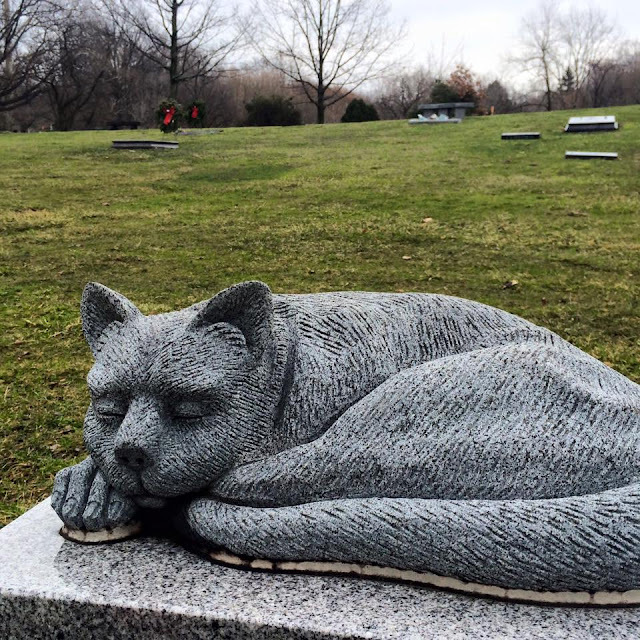 So many of the headstones include beautiful sculptures & statues, making Lake View feel just as much like an outdoor art museum as a cemetery where you're supposed to be sober & sad. Truly, it's full of beautiful works of arts that make it fascinating, interesting, relaxing - even as folks mourn & lay flowers at the graves of loved ones. It's a bit of a strange dichotomy. 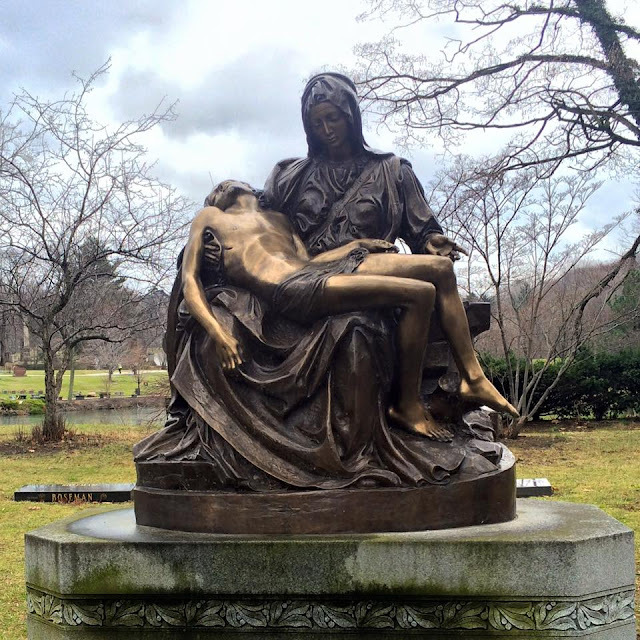 Like, how about this massive recreation of the Pietà as a headstone?! 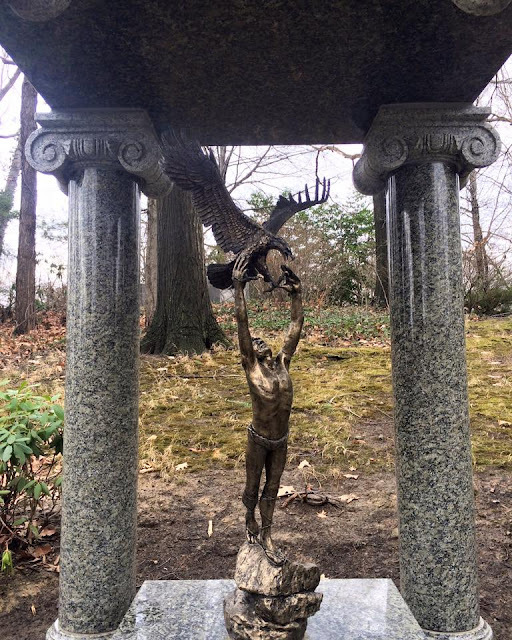 This unusually shaped marble & bronze memorial includes a Robert Browning quote: "Ah, but a man's reach should exceed his grasp, or what's a heaven for?" 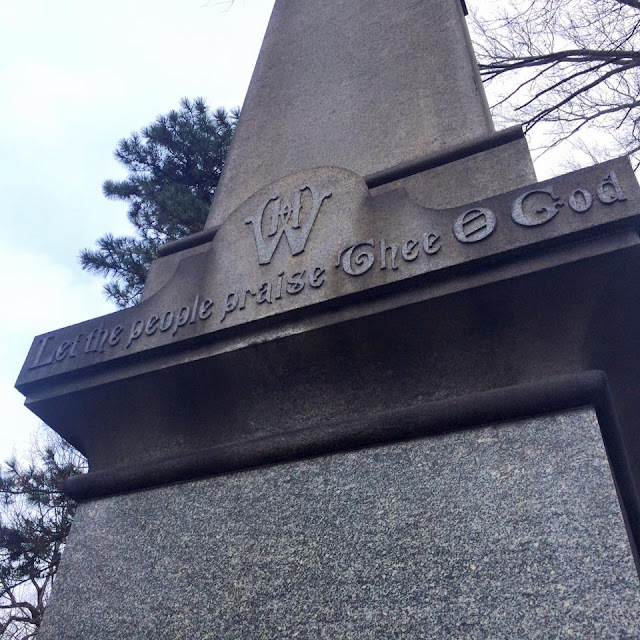 This headstone, the tallest we saw, is in memory of Western Union founder Jeptha Wade. 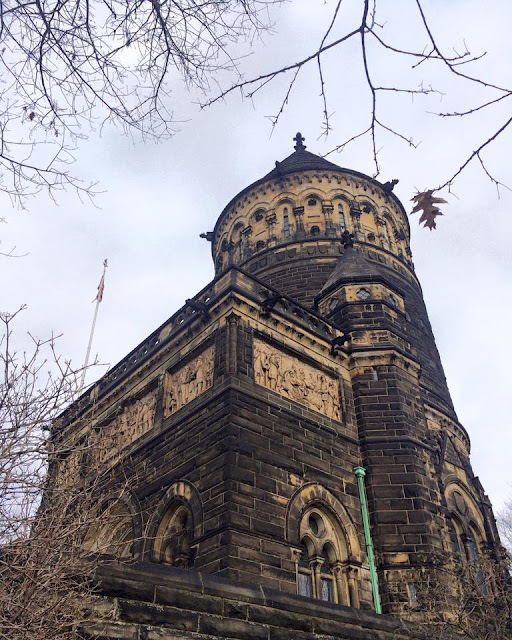 The cemetery's chapel is named for him, too, as is Wade Oval at Cleveland's University Circle - which home to an ice skating rink in the winter, also on my Cleveland Bucket List! ...like this one! 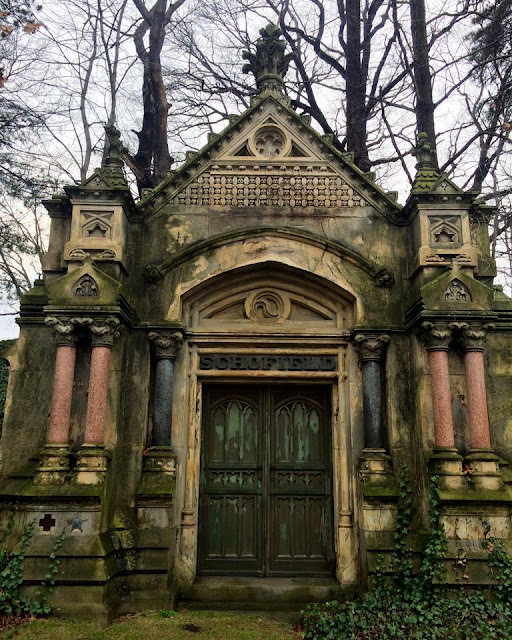 I'm guessing this mossy mausoleum belongs to the same family for whom Cleveland's Brainard Road is named. Seriously, this is straight out of The Hobbit, right? And this one, my favorite, is like a tiny castle. I love all the different colors - some intentional & some as a result of time & environment. Don't blink! 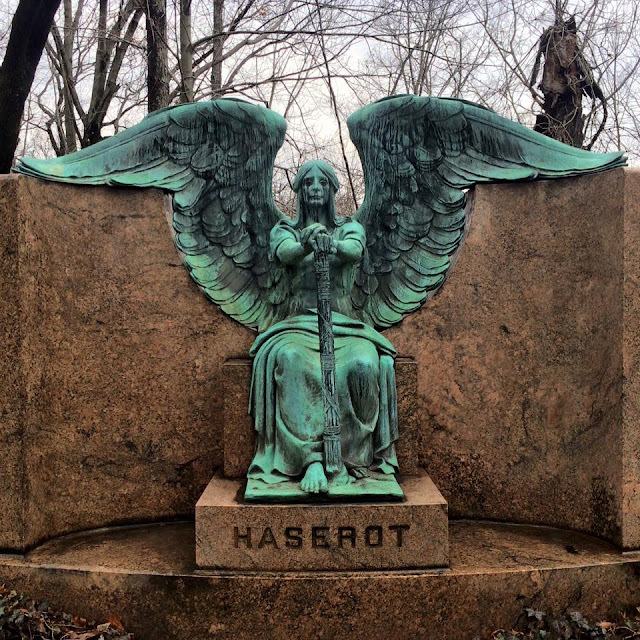 Most of the Lake View photos on Instagram seem to be of this statue, known as the Haserot Angel or the Angel of Death Victorious. 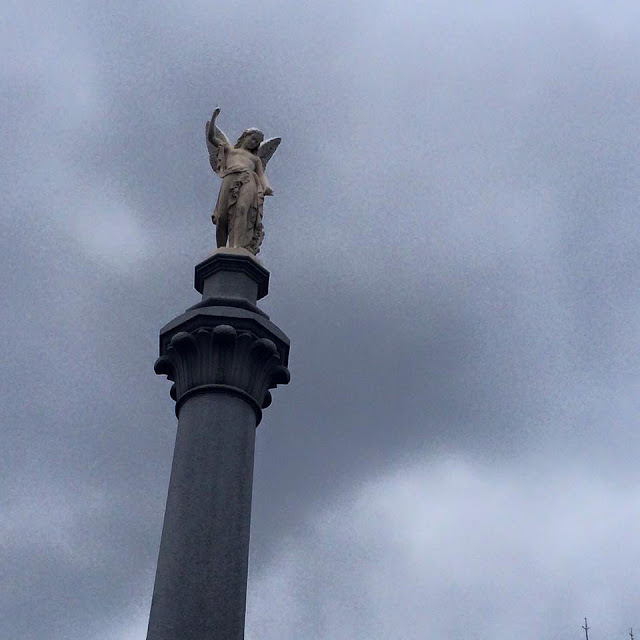 The angel holds an upside-down torch to represent life extinguished - & he's said to be one of the most haunted spots in Cleveland. Seriously. Looks haunted to me, right? 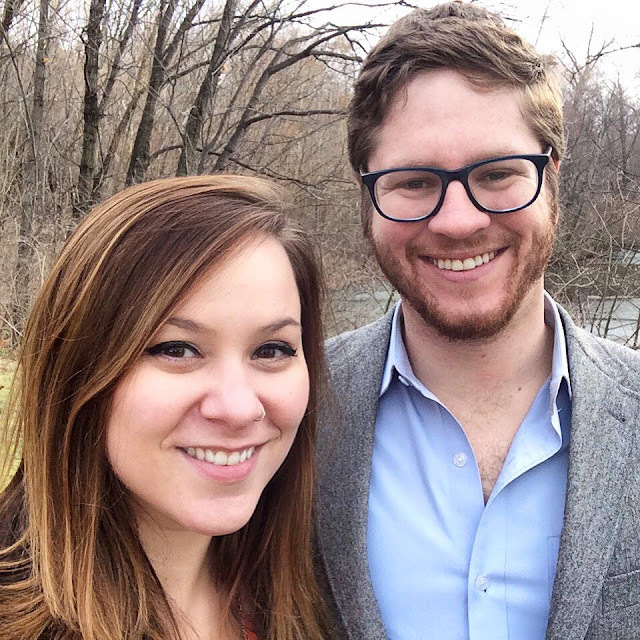 The Haserot family is behind Northern Haserot, a successful food distribution company in Ohio & Michigan that's still active today. 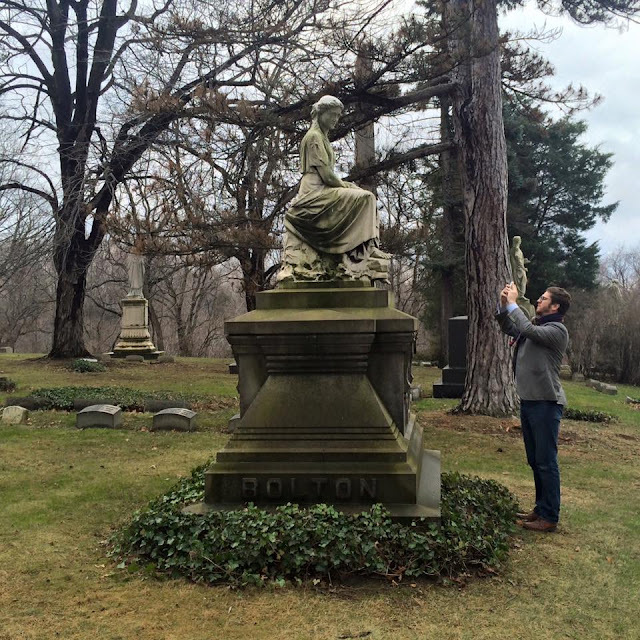 I wonder how the remaining Haserots feel about tourists' obsession with their ancestors' grave site? 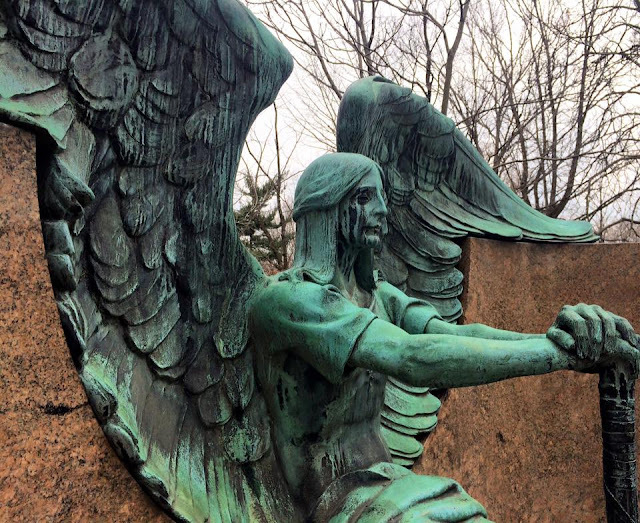 As you move toward some of the more recent burial sites in Lake View, you'll find fewer statues of angels & more statues of... well, all kinds of things. 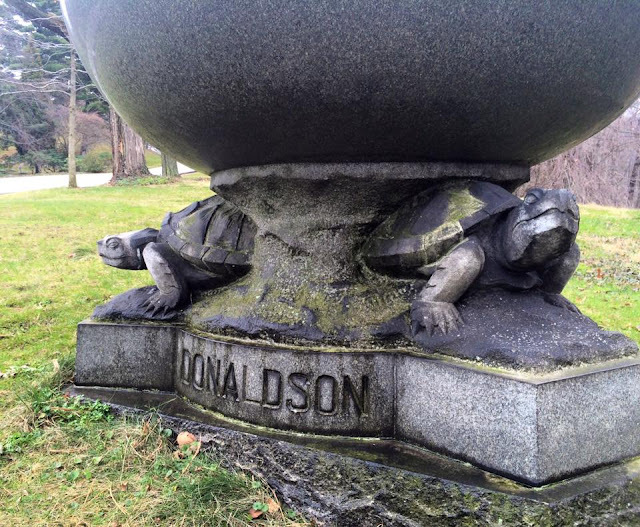 For starters, how about this large bowl upheld by stone turtles? 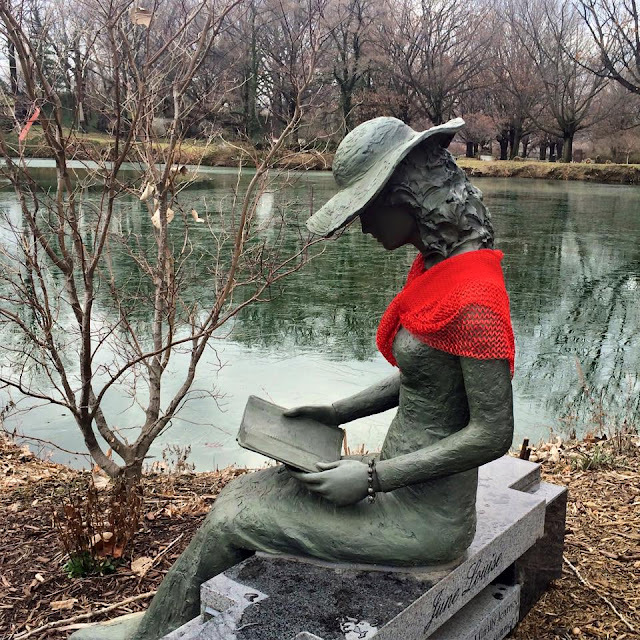 Someone even outfitted this memorial statue with a colorful scarf & a jaunty bracelet on as she sits next to the duck pond, forever immersed in a good book. 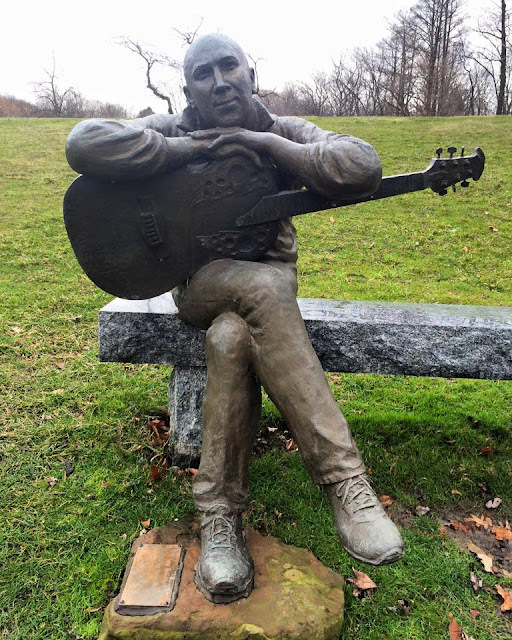 This man died young, in his 40s, & a sculptor - presumably a friend - created a life-sized statue of him & his guitar to remember him by. At first I thought it was creepy, but then Mike said, "Someone must've really loved him," & it stopped being weird & started being really wonderful. I wish I knew more about him & what kind of music he made when he was alive. 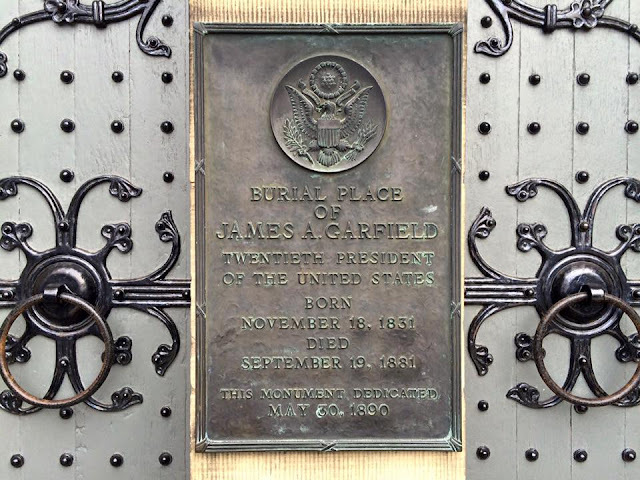 Finally, we made our way to the James A. Garfield Memorial, which is, in my humble opinion, not a particularly attractive building. Still, it's pretty cool to have a president buried right here in town, right? The memorial was dedicated in 1890 to honor our 20th president & is listed on the National Register of Historic Places. 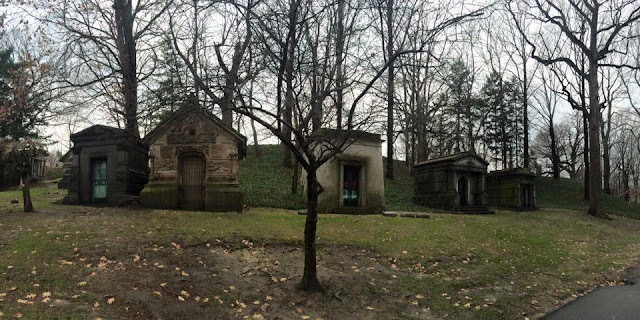 The caskets of Garfield & his wife Lucretia are on display inside, though the building is only open from April through November, so we couldn't check it out beyond exploring the outside. There's so much we didn't see. We didn't find the Rockefeller Monument, & like the Garfield memorial, Wade Chapel is only open in the warmer months. It's one of the few interiors left in the world that was totally designed by Louis Comfort Tiffany - you know, the Tiffany lamps guy? So cool. We also didn't get to check out the 9/11 memorial or the community mausoleum or the placard that thanks all those Clevelanders who have donated their bodies to science. So I guess we'll have to go back? I think I can deal with that - & in fact, I think this is one of my new favorite places, not just in Cleveland but period. Bring on the adventures, CLE. You're off to a damn good start.